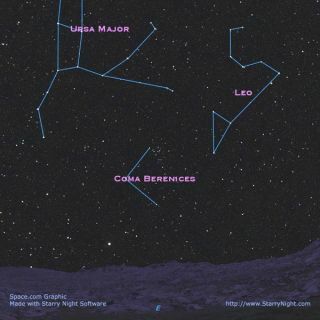 From midnorthern latitudes, Coma Berenices can be seen in the eastern sky after twilight has ended. Look for a scattering of stars between the tails of the Great Bear and the Lion. During last February's total lunar eclipse I was emceeing aneclipse party at my local town park. About 150 people gathered to watch theeclipse through a variety of different instruments. During the 50-minutes thatthe moon was completely immersed in the Earth's shadow, the sky had darkenedconsiderably and allowed us to see many of the fainter stars andconstellations. It was while I was talking about our old friend, Leo the Lion,that someone in the crowd asked me to identify a "tiny cloud oflight" situated between Leo and the Big Dipper. "Believe it ornot," I replied, "you're looking at the celestial wig." And with that I launched into the story of Berenice's Hair. A queen who "wigged out!" While virtually all of the constellations are named formythological people, beasts and inanimate objects, Berenice's Hair (known asComa Berenices) is actually associated with a real person. Eratosthenes in the3rd century BC was among the first to make note of this faint group of stars.This pattern of stars is actually a large, loose star cluster some 250light-years away. And indeed, to the unaided eye it appears as a faintshimmering patch of light on clear moonless nights. As a cluster, Coma Berenices is by far at its best in a pairof good binoculars. If, on the other hand you attempt observation of it with ahigh-powered telescope the impression of a cluster will become totally lostbecause of the telescope's narrower field of view. Berenice II was an Egyptian queen, the wife of PtolemyEuergenes (also known as Ptolemy III), the king of Egypt,who reigned around 250 BC. The story goes that Berenice sacrificed herbeautiful amber tresses and placed them in the temple of Aphrodite at Zephyriumas she vowed to do if her husband returned victorious from his war against Syria. Shortly after the royal couple's happy reunion, however, the hair mysteriouslyvanished, apparently stolen from the temple. As you might expect, when Berenice found out what hadhappened she was (to put it mildly) ticked off. But it was Conon of Samos, a court astronomer andmathematician, who eventually convinced the disconsolate queen that the godshad taken her beautiful locks and placed them up in the sky, for all to admire.Such is the story of how the cluster probably received its moniker, though thisregion was not generally recognized as the separate constellation of ComaBerenices until the beginning of the 17th century. Initially, in fact, many ofthe star atlases of that era did not depict this star cluster as a celestialhairpiece. Indeed, in various star maps of the late middle ages thecluster was identified as a rose-wreath or ivy-wreath, and occasionally as asheaf of wheat held in the hands of the nearby constellation Virgo. Others sawit as the hair of Sampson, not Berenice, while still others regarded it as atuft at the end of the tail of Leo, the Lion. Credit is usually given to theastronomer Tycho Brahe for first cataloguing it officially as Coma Berenices inthe year 1602. No milk for you tonight! The sight of Coma Berenices high in the sky is bad news, ifyou are a fan of the Milky Way. Just to the east of this cluster is the north galactic pole,one of two points in the sky lying farthest from the ghostly circle of lightthat composes the Milky Way. As darkness falls this week, the cluster is abouthalfway up in the eastern sky, while the wintertime branch of the Milky Wayappears about halfway down in the west. As the night progresses, and as thecluster rises higher, the Milky Way is dropping lower. When the cluster passesalmost directly overhead around 1 a.m. local daylight time, there is little tobe seen of the Milky Way itself; for it then runs completely around the horizonand is most always obliterated by the thicker layer of haze that perpetuallyrims the horizon. Conversely, when the cluster is rising or setting, the MilkyWay appears to arch high across the sky. Nowadays, you'll have to get up justbefore dawn breaks to get such a view. Or as Hans A. Rey (1898-1977) noted in his now classic book,The Stars, A New Way to See Them: "Thus, no hair can ever get intothe milk, celestially speaking."